The Lavanify is a genus of mammals from Madagascar that dates back to the Maastrichtian era in the late Cretaceous period, which was about 71 – 66 million years ago. Only one species is recognised, and is known from just 2 teeth which were collected in the mid-1990’s. This animal is a member of the Gondwanatheria group, which is a classification for animals which have an unclear phylogenetic relationship. However, this animal is thought to be closely related to the Gondwanatherium, Sudamerica, and Bharattherium groups. These 2 teeth were found in 1995 and 1996 during a joint expedition by the Univeristy of Antananarivo, Stony Brook University, the State University of New York. 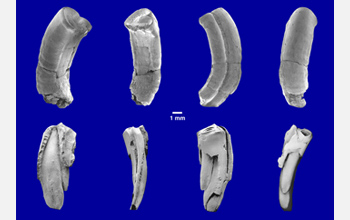 These teeth were found in different sites. One was found in white sandstone at the Maevarano Formation near Verivotra and has been placed in the collection of the University of Antananarivo, while the other is deposited in the collection of the Field Museum of Natural History. In 1997, David Krause and his colleagues scientifically described the Lavanify. It was the the first gondwanathere mammal found outside of Argentina. As only the teeth of this mammal has been uncovered thus far, this is the only information that we know about this anima. The Lavanify’s teeth were curved and had high crowns. One of the teeth is 11.2 mm high and has a deep furrow. In the middle of its crown is a V-shaped area consisting of dentine. The other tooth is 9.8 mm but is slightly damaged. It does have one deep cavity though. Both the Lavanify and Bharattherium share a furrow and infundibulum, and it has bands of matrix between the prisms of the tooth. There are also wave-like ridges and grooves present in the surface of the enamel.